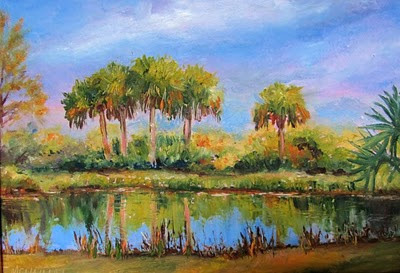 “Afternoon Glow at Hackberry Hammock” by Lori McNamara, oil on masonite. It was the first day on the job, her first assignment in a major hospital, on the 8th floor of the building as high as her aspirations, and as she stepped into the room of the first patient, to check on him, she knew something was not right. The very air in the room told her so, the patient’s eyes, his position on the bed, the sun refusing to enter the room yet, to heighten the walls, to gather the burst of dawn, as if on command; the man in the bed, suddenly in her ken, past reach, breathless, motionless, beyond her, brand new nurse on the job. The early morning preparation for this day had been hectic, but complete; her ‘whites’ virginal, washed, starched, ready to collect the day, the debris, the signs and signals and discoveries of life and all kinds of ailments to be posted on her person … as well as on the creases, pressed identifications of a nurse, brought intimately to her by people she did not know, likely had never seen, would see this very day possibly at their worst, or the worst they may have been. Such as this man whose chart she has just read, telling her how he had come here, for what reason, and now, with insight, telling her how long he would stay … or leave. Shaken, she checked the vitals the way training had shown, confirmed her first knowledge, this rampant intuition, this headway into a long and heavily desired occupation, life work, somewhat prepared to find and advise the doctor in charge. She said a discovery prayer, a prayer for a good voyage, a sad goodbye; Death, she realized from the moment, was no stranger to her, not the presence nor the alarm of it. She had been right beside it since the day of her birth. Again, it was knocking her stunned, not believing what she knew, having seen it before, having felt it tear down inside of her like a runaway projectile. Into the hallway she stepped and a bright-eyed night cleaner in white denims, humming a country song, lips feigning a whistle, was on his last rounds, rattling plastic containers in a soft concert of morning, the sun suddenly splattering with brazen entry, neatness and order in the atmosphere, reflections catching her eyes … and then, like an old photograph on the mantel, she saw the man’s family coming down the hallway, the just-found dead man’s family, earliest visitors of this, her first day in this huge metropolis of a hospital. Bang! Whomp! Responsibility clutching for direction, release. What did the books say? What did the nuns say at the training hospital? What did Sister Regina say when came the first surprise? Her own recent feelings jumped at her, clean through from that other side, whatever place they had been waiting for eruption, recall, oh, be known again. All the world, all of life, her life, poured through her: she was a twin, twin to a brother, love unequaled, paired forever, and remembered the call to report one morning to the habited chief nurse of the nursing school in Maine far from home. It was unusual; she hadn’t kicked the can around the night before, sparkler that she was out of class, away from the campus, the stuffy rooms, the march of death leaving a notch on her belt. Her marks and test scores were keeping her enough in place, the sun still poured through the windows, and in a quick moment, in a frightening, horrid moment, in an unbelievable moment before she physically tore the wimple and coif off the nun’s head, she was told that her twin brother was dead, killed by electricity trying to retrieve a boy’s kite from the limbs of a tree where live wires had been passed through as though a tunnel was available …… and never was. The wimple went flying in the air. She closed the door of the room behind her, stood like Rostom Razmadze protecting Napoleon Bonaparte from unbalanced intruders, unlikely patrons, seekers of the golden touch, personally good news from the autocratic hand, the voice of the century. Protect themselves from themselves, Death not being a particular intruder no matter how famous the body. Again, like a refrain, her life ran through her, the constant tumble of her brothers, the sole girl amid the horde of them, the boy she skipped school with who wound up on the mound of several major league teams, who came to Fenway Park, sometimes stayed in place after stats were garnered, who stood like these strangers before her, known only by intuition, invention, admission, to have life and death dragged right through them so soon after breakfast, the rise of the sun, from salutations on the way here to worry and surprise without end. Tom Sheehan has published 22 books, has had multiple work in many publications: Literally Stories, Ocean Magazine, Rosebud, Linnet’s Wings, Serving House Journal, Copperfield Review, KYSO Flash, La Joie Magazine, Soundings East, Vermont Literary Review, Literary Orphans, Indiana Voices Journal, Frontier Tales, Deep South Magazine, Western Online Magazine, Provo Canyon Review, Vine Leaves Journal, Nazar Look, Eastlit, Rope & Wire Magazine, The Literary Yard, KYSO Journal, Green Silk Journal, Fiction on the Web, The Path, Faith-Hope and Fiction, The Cenacle, etc. He has 30 Pushcart nominations, and five Best of the Net nominations (and one winner) and short story awards from Nazar Look for 2012- 2015. Swan River Daisy, his first chapbook, is just released and The Cowboys, a collection of western short stories, is due shortly. Read an interview with Tom here.